Each migratory season, NYC Audubon hosts birding tours in the park. Despite the park's relative size, our spring tours proved once again that Bryant Park holds its own among New York City's birding spots. This year boasted record-breaking tour attendance, in addition to American Woodcock and Marsh Wren sightings. Thursday night, 26 people joined the walk through construction projects, yoga class setup, and other after-work activity. There will be one final tour this season, so be sure to attend this Thursday. 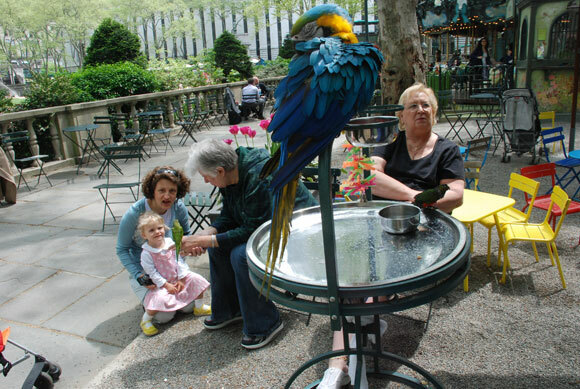 While you wait for fall migration, you can Meet the Birds each Tuesday at Le Carrousel. Birds of a tropical persuasion visit the park from Arcadia Bird Sanctuary each week. You can hold the birds, take pictures, or chat with Arcadia Director Terri Jones.